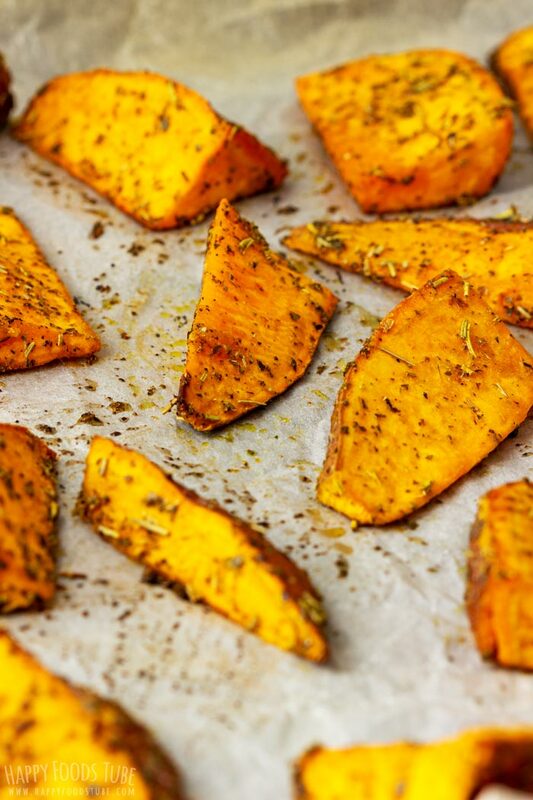 Oven roasted sweet potato wedges are quick and easy to make. 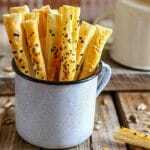 They go so well with cranberry dip or serve them as a side with any meat. 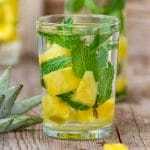 A flavorful side or snack! 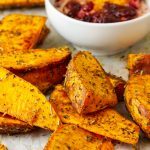 These oven roasted sweet potato wedges can be served any way you like but they are best while still warm. And they are also suitable for vegans! Sweet potatoes are such a versatile vegetable. They can be used in soups, pies, casseroles. They are perfect for making appetizers, side dishes, breads (Sweet Potato Flatbread is one of the easiest things to make!) mains (Sweet Potato Gnocchi), salads …. 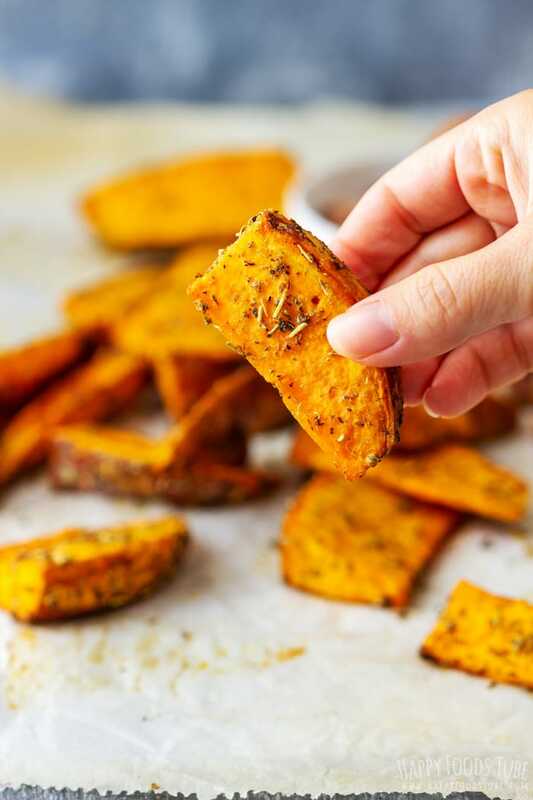 I have a good collection of Sweet Potato Recipes on my blog in case this oven roasted sweet potato wedges recipe is not what you were looking for. 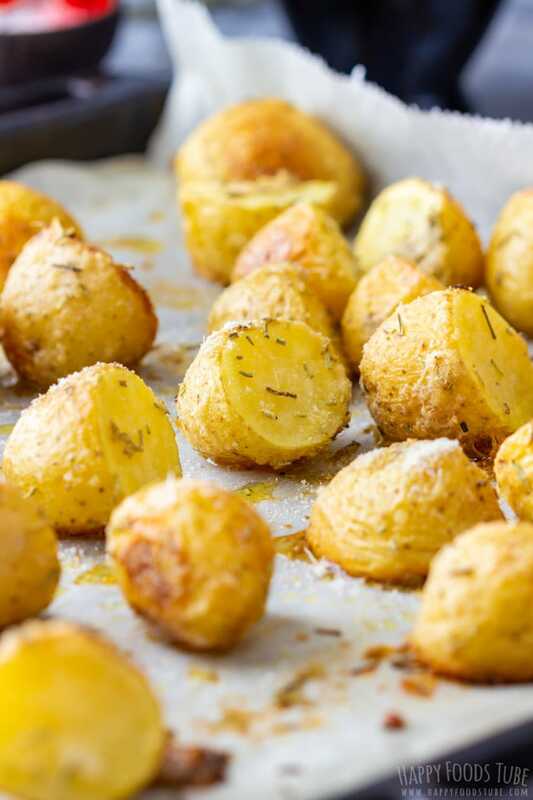 Or maybe you would like to try Rosemary Parmesan Roasted Potatoes. It’s one of the best potato side dishes, in my honest opinion. This is a very quick recipe when it comes to preparation so I suggest you start with turning on the oven first. Now all you have to do is prep the sweet potato. Make sure to wash it thoroughly under running water. This is an important step because you will not be peeling the skin off so any dirt that stays on the skin would end up in your mouth and we don’t want that. I usually take my time to do this properly. 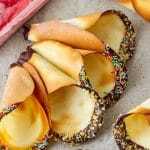 Cut it into wedges and place them into a large mixing bowl. I prefer using a bowl so I can to toss the sweet potato wedges with the rest of the ingredients well. The more you toss, the better the seasoning coats each wedge. This step is quite important and only takes about 30 seconds, maybe little longer but it is well worth it. 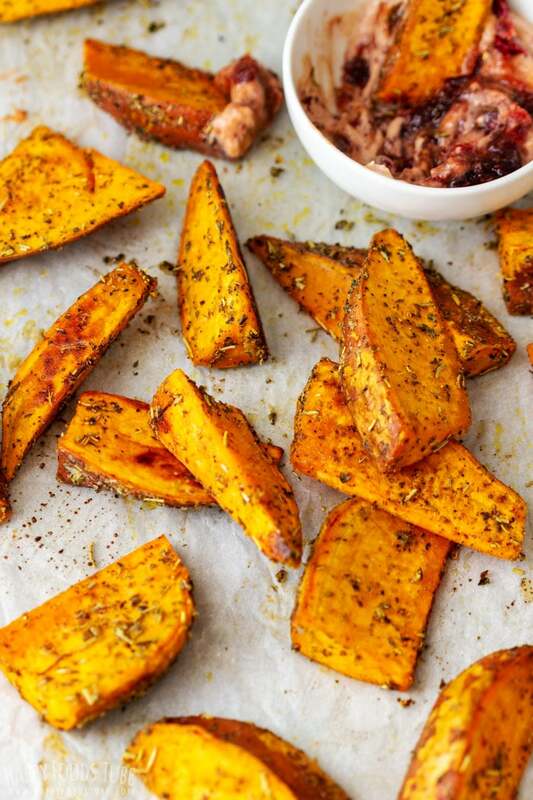 If you are after well-seasoned oven roasted sweet potato wedges, this is the way to go. 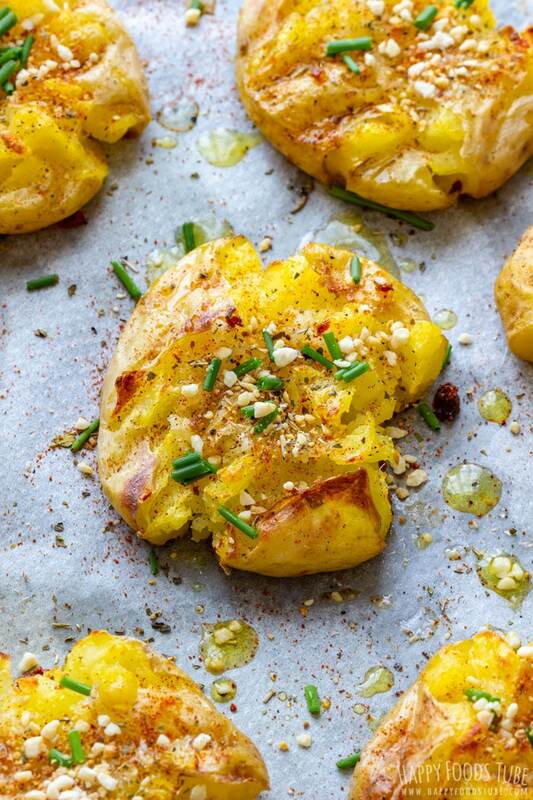 Don’t be tempted seasoning the potatoes after you have transferred them onto a baking tray. How to cut sweet potato wedges? If using small sweet potatoes: Trim off the ends. 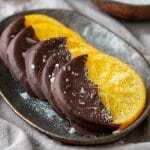 Cut each one in half (lengthwise). Now cut each half into half and again into half. You will end up with 8 pieces. If using 1 large potato: Trim off the ends. Cut each one in half but this time crosswise. It makes it easier to cut. Now I place each half onto a chopping board (the wide side down) and cut it into quarters. That way the potato stands on the chopping board without moving and I can cut through them easier. Now you can place the quarters (already looking like wedges) onto a chopping board skin side down, cut each in half again and you are done! How long do sweet potato wedges take in the oven? This will depend on their size and thickness. I used one large sweet potato (1.3 pounds/600g in weight) that I cut into 16 wedges. They needed about 20 minutes in the oven. Smaller and thinner oven roasted sweet potato wedges might take less than that. When you take them out after this time, they will not be crispy on the outside so the best option is to put them under a broil for a few minutes in case you like them crispy. 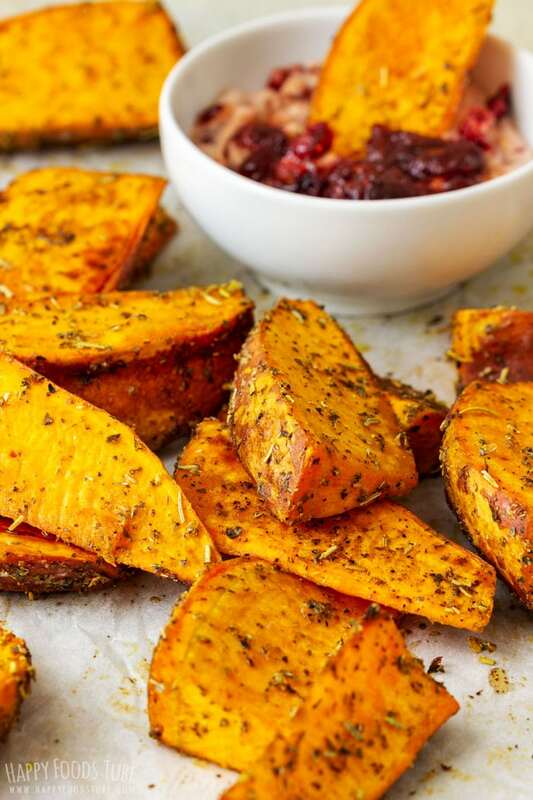 I like serving these oven roasted sweet potato wedges with a quick dip I make with my leftover Instant Pot Cranberry Sauce, cream cheese and hot sauce. Sometimes I add sour cream or Greek yogurt to it too. Wash the sweet potato thoroughly under running water, making sure to remove any dirt. Trim off the ends. Cut it in half crosswise. Place each half onto a chopping board (the wide side down) and cut it into quarters. That way the potato stands on the chopping board without moving which makes it easier to cut them through. Place the quarters (thick wedges) onto a chopping board skin side down, cut each in half again and you are done! Transfer the wedges into a large mixing bowl. Add the rest of the ingredients and toss the wedges well making sure every single one is covered with the seasoning. Transfer them onto a baking tray lined with baking parchment and spread them around. Bake them in a preheated oven at 400°F/200°C for 20 minutes or until they are cooked through. Serve as a side or with a dip of your choice. I used 1 large sweet potato but if your local store sells smaller ones, go ahead and use those. Just make sure they weigh around 1.3 pounds (600g) in total. Cutting small sweet potatoes into wedges: Trim off the ends. Cut them in half lengthwise. Now cut each half into half and again in half. 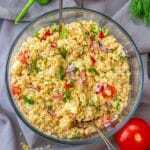 This recipe is also suitable for vegans. 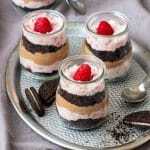 More tips and detailed notes as well as photos can be found in the post above the recipe card. 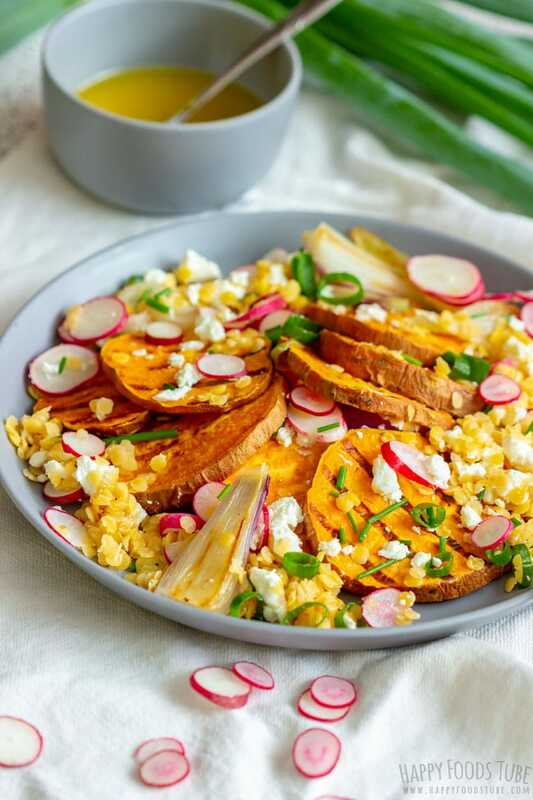 I love sweet potatoes and those look amazing. I can taste them just looking at them. YUM! Sharing these. YUM! 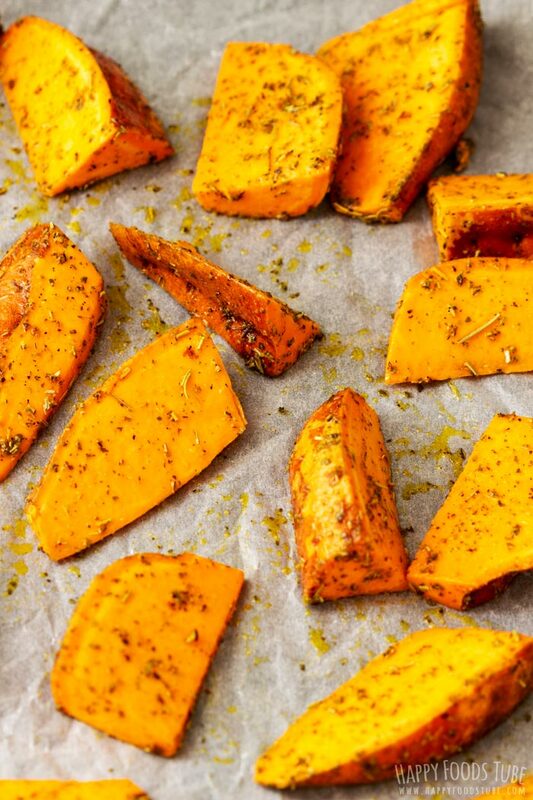 I love oven roasted sweet potatoes and these look so crispy and delicious! 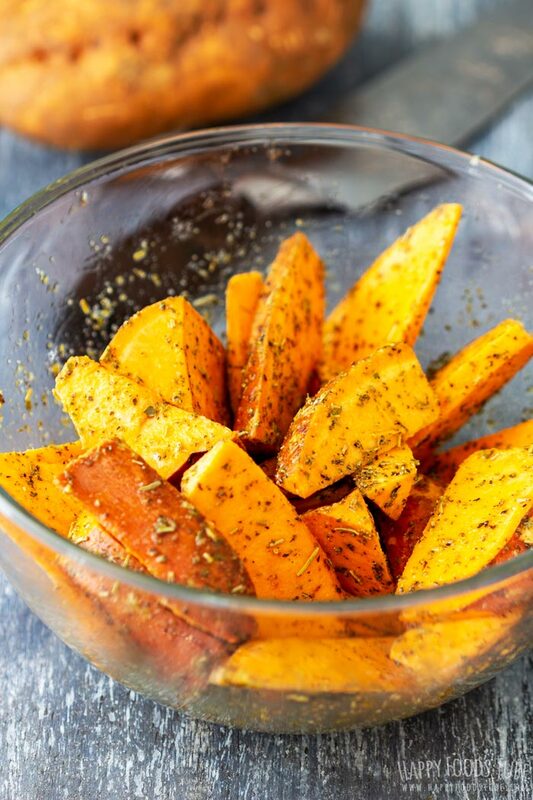 I love making homemade sweet potato wedges (and fries) love the seasonings you used for these, I love how versatile sweet potatoes are; I like to switch up the herbs I use and sometimes I even put a bit of tomato puree in there to make “pizza fries”. Definitely going to try these soon! I love roasting vegetables! 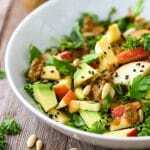 It is healthy and delicious. Great suggestion of serving sweet potato wedges with cranberry sauce, I’ve never tried it! 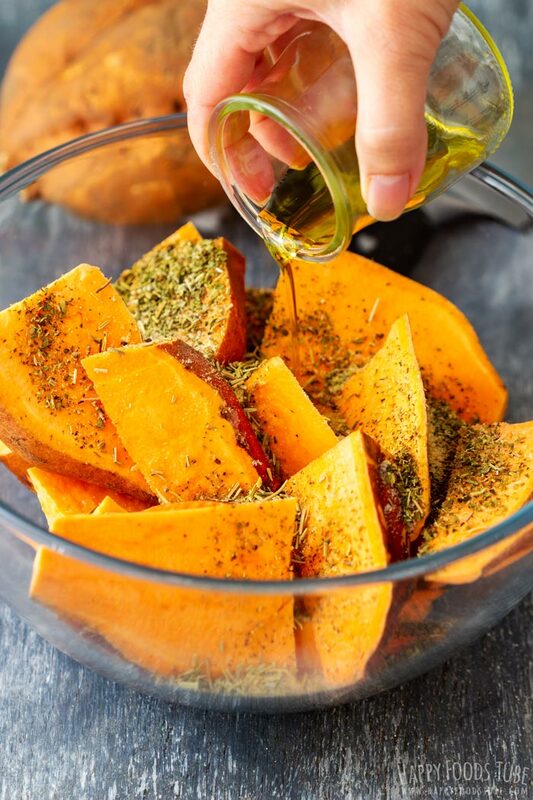 I’ve never had savory sweet potatoes, yours looks so delicious I gotta give them a try!